(March 25, 2019) – The second quarter 2019 edition of the Financial Analysts Journal, published by the CFA Institute, includes a research paper written by James Yaworski, CFA, Senior Investment Strategist at Carlson Capital Management. Through this research, Yaworski sets out to provide institutional investors with a more robust way of constructing spending policies. He shows how current practices create poor long-term outcomes, resulting in declining support for beneficiaries over time. He also demonstrates how current methods expose trustees to significant fiduciary risk, and how small errors in implementation can have significant long-term ramifications on portfolio growth. In the paper, Yaworski lays out the framework for the construction of more efficient spending policies, which enhances an organization’s ability to achieve long-term goals while greatly reducing the fiduciary risk to which trustees are exposed. James’ in-depth and thoughtful research stems from his genuine interest in providing university, public and private foundations, and endowment trustees with an approach that not only optimizes the outcomes of their portfolio’s performance, but also addresses their fiduciary responsibility with regard to spending policies. The paper should be of interest to trustees, beneficiaries, and donors who wish to ensure the sustainable management of endowed gifts. “My hope is that this paper will have a significant positive impact on the non-profit community, providing guidance to trustees of endowments and foundations on how they can improve the stewardship of endowed assets,” stated Yaworski. The paper is available in the most current issue of the Financial Analysts Journal. The Financial Analysts Journal, a publication of the CFA Institute, aims to be the leading practitioner journal in the investment management community by advancing the knowledge and understanding of the practice of investment management through the publication of rigorous, peer-reviewed, practitioner-relevant research from leading academics and practitioners. Institutional investors, such as university endowments and foundations, rely upon mathematical formulas known as spending rules to determine how much they can distribute each year. This research builds upon thirty years of work by both academics and practitioners that shows poor long-term outcomes for institutions that use current methods. This paper looks at historical performance, as well as simulations, to find that current methods create a 1% annual portfolio drag, which over time has a significant impact on portfolio values. The result is that many institutions are likely failing to fulfill their promise to donors that they’ll steward these assets in a sustainable manner and preserve the purchasing power of the original gift. Current spending methods place considerable fiduciary risk on trustees. These rules require trustees to determine a proper spending rate by forecasting future portfolio returns and inflation. Any error in this process can have a significant negative impact on portfolio growth, not just during the trustee’s tenure, but for decades into the future. Given the difficulty of forecasting future returns and inflation in a precise manner, trustees should question why they’re utilizing a tool which provides so little margin for error. Spending methods are currently one size fits all, despite a wide range of institutional needs and preferences. Institutions should customize spending policies to reflect their short-term spending needs as well as long-term organizational goals, in order to optimize outcomes. Small foundations and large endowments have very different needs and goals, yet spending policies are not currently reflecting these differences. 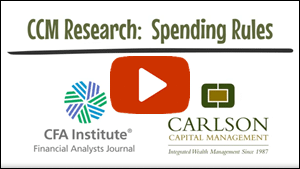 In this short video, author James Yaworski explains how university, public and private foundations can benefit from more efficient spending policies. James Michael Yaworski serves as Senior Investment Strategist at Carlson Capital Management. In this role, James is responsible for investment research, portfolio management, and client investment education. James monitors and reviews client portfolios to maintain balance across asset classes, makes recommendations for portfolios when out of alignment with models, reviews daily cash positions, and places trades through the custodial trading platform. He also provides new client portfolio analysis, asset class/portfolio research and analysis, prepares and presents client education materials, and manages other activities in support of overall client portfolio management. James is a graduate of Northern Illinois University where he earned his degree in Finance. While studying at NIU, he gained insights into his future career as part of a student-managed portfolio team. Prior to joining CCM, James’ experience included working in the roles of investment manager, project manager in investment research, and financial analyst in both large and small financial organizations. James holds the Chartered Financial Analyst (CFA Charter) designation, granted by the CFA Institute, which entails a rigorous exam requirement. He also represents CCM as chair of the investment research committee of Zero Alpha Group, a national network of eight independent wealth management firms. James enjoys being engaged in the community with Habitat for Humanity and Paws & Claws. In his free time he also enjoys golfing and playing softball. 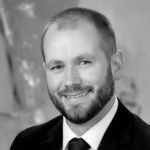 James grew up in Crystal Lake, Illinois and now resides in Rochester, Minnesota with his wife, Brittany, their daughter, and two dogs, Frankie and Jordy. I have grown to appreciate the importance of collaboration and teamwork in this industry. A group of individuals, each dedicated toward expertise in their respective fields, can help to piece together the puzzle of a family’s financial lives in an incredible manner. The end result is one which truly connects the math of an individual’s personal finances with the why that makes up who they are and what they want to achieve in life. As a member of our investment team, I enjoy every aspect of this process; from our discovery meetings where we learn about financial goals, to the analysis and construction of a financial plan, to the educational meetings where we help put all the pieces into place. Ultimately, building a relationship with clients that centers on creating financial security and establishing confidence in their financial plan is extremely gratifying. James and other members of the CCM Investment Team regularly post articles of interest including investment insights, recommended reading on timely topics, and articles on portfolio management which you can find here.